· Most of the time, if you're having problems adjusting the sling, it's because the fabric isn't threaded neatly through the rings. I send my slings out threaded, but the mere act of adjusting them can make the fabric scrunch up in the rings, which makes them more difficult to adjust. Whenever you make a major adjustment, take a moment to spread the fabric out in the rings again, as shown in the section on threading your sling and in the video below. · Some fabrics are more difficult to adjust than others. Unwashed silk, medium-weight twills, and thick fabrics like slingified wraps can all be tricky to adjust even when the fabric is spread out well in the rings. Use and frequent washing will soften the fabric, but the key ingredient is patience. Adjust a small section of the sling at a time. Yanking on the whole tail will rarely get the sling into a good position. 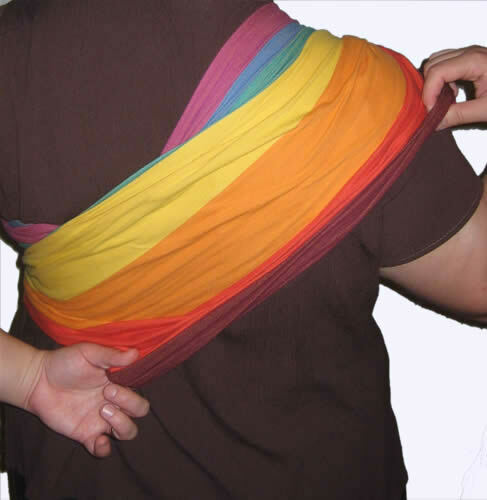 One of the benefits of a ring sling is that each part of the sling is individually adjustable, so if you need the bottom edge tightened, you can pull on the outside edge of the tail; and if you need the top edge tightened, you pull on the inside edge of the tail. · Take a few minutes to practice before putting the baby in the sling. You'll find it much easier to adjust without the baby in the sling. I like to get my slings as tight as I can (and still fit the baby in) before I pick her up. The less adjusting you have to do once she's in, the better. If you find that you need to adjust it once she's in, support her with your hand or arm (usually the one opposite the side the rings are on). The fabric will move a lot easier if her weight isn't also on it. 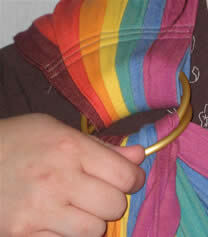 · To loosen a sling quickly, pull up and out on the exposed ring. That takes a lot of the tension off the sling, and will allow the fabric to flow more easily. Be sure that you are holding your child with your other hand, since once the tension is off, her weight may allow it to flow too easily! · Having the fabric spread evenly over your back will go a long way towards your comfort! The first picture below shows the fabric all bunched up. This is horribly uncomfortable! Don't let it happen to you! The second picture shows me spreading the fabric on the bottom edge. I like mine spread out almost to the small of my back. The third picture is spreading it out on the top edge, and of course, the fourth is the way it should look. · It's always best to try something new with a baby when she's well-rested and just fed, with a clean diaper and a happy disposition. I would also recommend practicing using the sling with a heavy, baby-sized object (like a bag of flour or rice in a zippered plastic bag, or a weighted doll, or perhaps a pet, if it will comply). The more confident you are when using it, the less anxiety your baby will pick up! 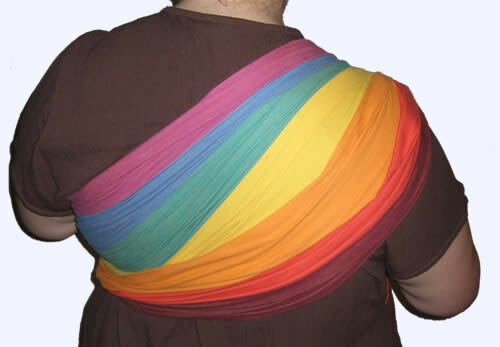 It is also very helpful to try the sling with someone who knows how to use one at hand to guide you. La Leche League meetings are a great source of experienced babywearers, or you may have a Babywearing International group near you. · If you have tried all of the above and your baby still doesn't seem happy in the sling, it may be that she doesn't like the position you are using. Neither of my babies liked the cradle hold for anything but nursing. They would cry if placed in a cradle hold, and if I didn't know any better, I might have assumed they just didn't like the sling. However, once I tried different holds -- particularly the cuddle hold -- they were much happier. Some babies just like to be upright. The cradle hold can be a problem for some babies' breathing, too. Their airway needs to be just right for them to be comfortable, so if you really want to use the cradle hold, be sure they are properly positioned, with their chins not tucked against their chest. It is helpful with a small baby to put the baby on a receiving blanket, and then put them in the sling with the blanket beneath their torso, as the blanket can keep them from sinking too far into the sling's pouch. · Some babies will cry no matter what. Stephen was colicky when he was new (and that didn't really clear up until I eliminated dairy from my diet, when he was about 4 months old), and so sometimes he also cried in the sling. However, I felt much better about his crying when I was actually holding him, in the sling or in arms, than I did allowing him to cry alone. Even though he was crying, at least he was with me. And then again, it's possible that some babies just don't like slings, and may do better with a different style of carrier. However, I would explore all the different holds before giving up, and if all else fails, wait a couple of months -- babies change so quickly! There are also some excellent troubleshooting guides on TheBabyWearer.com, and more directions, including video, at www.zolowear.com. If you find that you are having a problem that isn't covered here or there, please feel free to send me an email.